Articular cartilage is the soft white cartilage that covers the ends of the bones and helps joints to move smoothly. It also helps to absorb the forces throughout the knee. This articular cartilage surface can be damaged by trauma such as a sports injury. Normal use, including running, won’t wear out the cartilage unless it’s been previously injured or if the meniscus cartilage has been removed. Bone malalignment or being overweight can also contribute to damage. The diseases of osteoarthritis and inflammatory arthritis can directly damage the cartilage surfaces as well. Once damaged, articular cartilage will not heal on its own. Over time, the cartilage breaks down and the underlying bone reacts. As the bone stiffens and develops bone spurs, (osteophytes) the joints become inflamed and swollen, which damages the cartilage even more, leading to pain, swelling or loss of motion. This is traumatic osteoarthritis. Knee osteoarthritis is the most common form of arthritis, affecting millions of people around the world. Untreated, it is usually a progressive degenerative disease in which the joint cartilage gradually wears away. Articular cartilage damage is graded according to its severity. Grade 0: Normal healthy cartilage. Grade 1: The cartilage has a soft spot or blisters. Grade 2: Minor tears visible in the cartilage. Grade 3: Lesions have deep crevices (more than 50% of cartilage layer). Grade 4: Exposed underlying bone. Early identification and treatment of articular cartilage damage can have a significant effect on outcomes for patients. We address cartilage damage as part of our biologic joint replacement procedure. By repairing or replacing the damaged cartilage before it completely wears out, the arthritic damage can be reversed and the joints preserved. If this step is not taken, eventually the cartilage wear will progress so much that the bones will touch on each side of the joint, called bone on bone wear. At this stage, artificial joint replacement becomes necessary. Read more about The Stone Clinic’s new treatment paradigm for arthritis. At The Stone Clinic we have a unique procedure for repairing articular cartilage: the Articular Cartilage Stem Cell Paste Graft, designed by Dr. Stone in 1991. Articular cartilage paste grafting (often abbreviated as art cart or paste grafting) uses your own bone, cartilage and stem cells to regenerate your damaged cartilage. It is a minimally-invasive, single arthroscopic procedure that stimulates regrowth of damaged articular cartilage surfaces. The arthritic area of the knee, or the area where there is missing cartilage, is morselized by the surgeon to create a fresh blood supply and to bring stem cells to the surface. The graft is harvested from the intercondylar notch (a non-weight bearing part of the knee), crushed into a paste, and packed into the fractured chondral defect. The result is a repair technique that can provide durable cartilage repair tissue with long-term improvement in function and diminishment of pain. "Articular cartilage paste grafting has provided my patients with tremendous relief and permitted a return to sports for many arthritic joints that were thought to require joint replacement. Our published peer reviewed long-term outcome studies have matched or exceeded any other published work. Paste grafting has been a great tool for salvaging failed microfractures and other cartilage procedures." A study carried out by independent researchers proves that the paste graft produces superior tissue to an alternative cartilage regeneration procedure, the microfracture. In order to constantly improve our techniques we follow up on many of our paste graft patients. X rays: to check the joint space, bony spurs, alignment of the legs, signs of inflammatory arthritis. MRI: to see the condition of articular cartilage and meniscus which is shock absorber of knee. Cortisone: Injections of corticosteroid medications may relieve pain in your joint. The number of cortisone shots you can receive is limited by us, because the medication can damage the cartilage and worsen the arthritis over time. In general we prefer to use methods other than cortisone first whenever possible. Hyaluronic Acid: Injections of hyaluronic acid derivatives (Hyalgan, Synvisc) may offer pain relief by providing lubrication in the joint. We often combine growth factors with HA injections. Stem Cells: Stem cells from bone marrow or fat are being used to stimulate repair within joints. We use marrow derived stem cells in our meniscus, articular cartilage and ACL repair and replacement procedures. When a BioKnee replacement is not possible because the damage to the cartilage is too great, then we recommend an artificial knee replacement, a partial replacement if possible or a total replacement. We perform robot assisted surgery for superior results. When only part of a knee joint is worn out we choose to replace only that part, preserving the rest of the knee. Now with the use of a robot (MAKO) we are able to accurately resurface the injured area as an outpatient procedure. 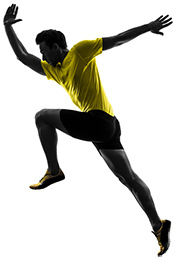 Our “only do what is necessary”, philosophy has the advantage of immediate pain relief and faster rehab. In artificial joint replacement surgery (arthroplasty), the damaged joint surfaces are replaced with plastic and metal devices called prostheses. These provide tremendous relief for the bone on bone patients. We no longer restrict the activities of our patients after joint replacement and encourage them to become more active than they have been in years. Artificial joints can wear out or come loose and may need to eventually be replaced.